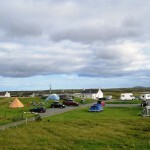 Moorcroft Camping and Bunkhouse is situated 1 mile south of Carinish village on the main A865 road, through North Uist. The site is positioned overlooking a tidal bay with views of the neighbouring island of Benbecula and also the hills of South Uist. Ideally located for shoreline and moorland walks with several places of historical interest close by with easy access to public transport. Site also includes small bunkhouse with 3 twin bedded rooms finished to a high standard. We have ten motorhome / caravan pitches with electric hookup, as well as 20+ tent pitches. The campers kitchen has a washing machine, tumble drier, sinks, microwave and dining table.